In case you hadn’t noticed, my website has been down for the last two weeks while I planned my business strategy for 2013 and made some much needed updates to the site. I’m pleased to announce that it is back up and running- let me know show you around! The overall look pretty much remained the same, but I felt like it was time for a change, so I updated the slider layout and played with the footer widgets a little bit. I also ironed out some of the mobile responsive bugs that had previously been there. Go over and click around for yourself! This was the thing that took me the longest- not because of the design, but because of what it had to say. I knew that this year I wanted to raise my prices so that I could afford to spend more time perfecting each project that I work on. I also decided to go towards a more personalized quote approach for each project, so I’ve simplified the packages that I’m offering to allow for some more flexibility when I quote my clients. This leads me to perhaps the biggest change for my business: I’ve decided to stop offering blog designs for Blogger. This was a hard decision for me, because I know a large segment of the blogger population uses it, and as I’ve said before, I think Blogger really is the right platform for a lot of people. However, in reflecting on 2012, I really want to have a better life/work balance this year. Starting last February, I contracted as a WordPress blog designer for a larger blog design company, which was a really great experience- I got to work with clients who I never would have been able to, and I really learned the ins and outs of WordPress. 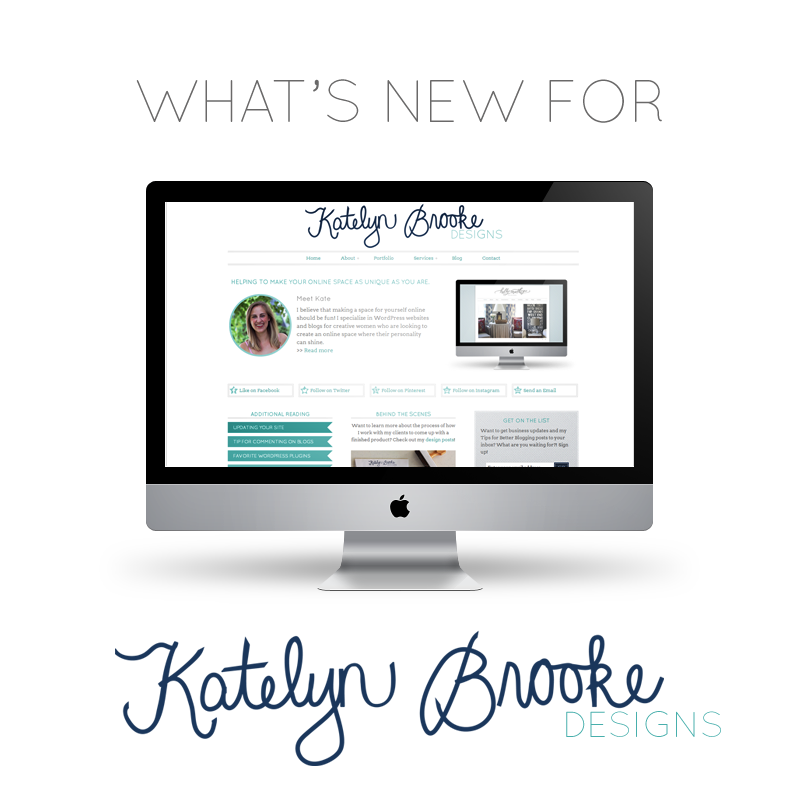 In addition to the 35 blog designs that I did for Katelyn Brooke Designs, I designed an additional 25 blogs. I just finished my last client through them last week. 60 clients a year meant that I had more than one client per week, and that pace just wasn’t sustainable for me. But in order to do less, I needed to raise my prices, and in order to do that, I need to be an expert at what I do. And as 2012 came to a close, I knew that designing and coding for WordPress was what I wanted to pursue exclusively. To ease this transition, I’ve compiled a little list of great designers who work with Blogger, so if you’re in the market don’t hesitate to email me! I want to thank you guys again for your continued support. I couldn’t do this without all of you- including my clients, friends, and readers! (And my family, of course!) I’m so excited to see what 2013 brings for my business and my blog now that I’m finally ready to go! I’d love for you to head over and take a look at the changes! If you see anything that’s messed up, PLEASE let me know! Thanks Lisa! It feels good to have it up, finally! I love the look, nice and clean! Good luck with your new ventures :) I am very jealous of people who can design websites! Thanks Anna :) I’m excited but it was definitely a little nerve-wracking putting it up yesterday! I really love your design style, Kate, and I wish you and your business all the best for this coming year (and any year in the future!). I think you do great work and I consistently find myself admiring the designs you post. hopefully 2013 will be a great year for Katelyn Brooke Designs! Looks great, Kate! I can’t wait for my site to be transformed by you. Thanks Elizabeth- me too, I’m so excited to work with you! I wish you well. Your name looks so crisp. Looks great. Is there a special technique for that? Thanks Mark! I drew my name on a Wacom tablet, and then adjusted the outlines a little in Illustrator to get the exact shape that I wanted. Congrats! Good on you for making those changes to help your business and expertise grow. Do you mind sharing which blog design company you contracted with to do WordPress blog designs? Thanks! I’m not sure that they’re looking for anyone right now, but if you email me I can send you the link! the site looks great! congratulations on re-focusing for 2013! I’ve been watching all the changes you’ve been making over the last few months and am so happy that you are doing so well! Congratulations!!! Love the new look…and I, for one, am so happy you contracted with the “larger blog design company” because that’s how I found you. :) Hope your business takes off in ways you never dreamed and that you love every minute of it. Kate – I’m glad for your exciting new plans – you’re wonderful at what you do and great to work with. All the best! Love your new site! I have been following you now for a couple of months, I am preparing to launch my blog on March 1st, and you have been a great resource for me! Keep up the Awesome work!! Congrats! I love looking at the work that you do!